Heading out on a camping trip this winter? Here's how to insulate a tent for winter camping. This post includes numerous tips and gear suggestions so you'll stay comfortable and safe from the cold. Depending on the type of camping you are planning to do this winter there are added little things you can do to stay warmer. Tips and tricks of the experienced campers that will keep your toes toasty along with the rest of you. No, we don’t mean lugging around a car full of blankets. The good news is that there are lightweight options for you that are easy to set up and easy on the wallet as well, so you can adapt your summer tent to become your winter tent quite easily. Let’s get started so you can get out there and enjoy those pristine winter landscapes and explore the empty trails because let’s face it, that is the biggest perk of winter camping… practically having the place to yourselves. So, here are 9 helpful tips to help you stay warm all night long. Smaller is warmer. The less space you have to heat means the more heat that stays near you. 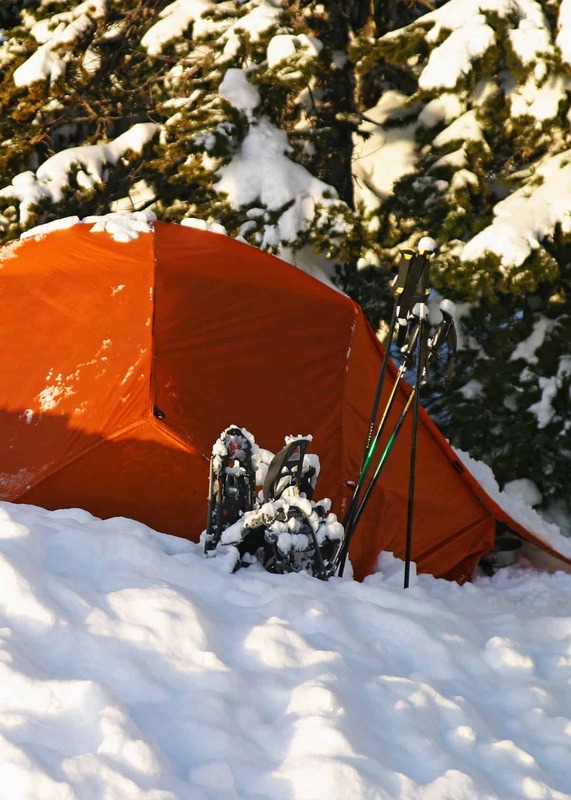 It may seem like common sense but if you camp year round, that big breezy summer tent may be an icicle in winter, so perhaps look at investing in a smaller tent for winter to lock that heat in. Or, if you like having more room, then there are plenty of tents on the market specially designed for camping in winter that even allow you to have a small stove inside which will definitely keep you toasty warm. Just be sure to use any indoor heating source very carefully and never leave it unattended. Here's our Safe Camping Guide to Tent Heaters. The last thing you want is to damage the tent and end the camping trip. You would never live it down and friends and family would be talking about that around the campfire for years to come. A ground mat, rug, blanket (even large towels if you have nothing else) can be used to insulate the floor of your tent making your night´s sleep more comfortable by helping to stop or greatly reduce the cold winter seeping into your bones. There are sleeping mats specially designed for this which are great for putting a buffer between you and the cold winter ground. TNH Outdoors have mastered the art of winter camping sleeping mats with their one and half-inch-thick self-inflating mat. Just unroll and it does the rest for you only requiring a couple of puffs from you. Durable and made of quality materials, it will last you years as it meets their Rethink. Reduce. Reuse. pledge to reduce 10 Billion Tons of Waste to the outdoors so it’s made to last. Waterproofing a larger rain fly, tarp or cover and placing it over your tent will not only keep dew, frost, and snow out, but also help locks heat in. Before you leave home set up your larger winter rain fly and test it by spraying it with the hose. If you see leaking, then re-waterproof it before your trip to help dew, fog, rain or snow slide right off. Another option is to buy one, especially for your winter gear. It doesn’t have to break the bank and it can also be used as a lean-to, windbreak or ground cover. B-Air tarps are waterproof and available in a variety of sizes so you are bound to find one that will suit your needs and tent size. Try to set your tent up near a natural windbreak, like shrubs or a large rock formation. This helps reduce the icy winds. Alternatively, you can pull one side of your tarp down and stake it into the ground so it acts like a lean-to creating a windbreak. This helps lock in more heat and keep those icy winds at bay. Heat packs are a good way to heat up your sleeping bag and keep you warm all night. The impressive thing is that they even get warmer when in your pocket or sleeping bag. If they start to lose heat just expose them to air, give them a shake and voila, the warmth returns. Hot Hands have a good range for hands and body to take with you. Alternatively, you can take a hot water bottle. It’s a winner, but just remember to make sure the lid is screwed in nice and tight so it doesn’t leak. There's nothing worse than cold wet feet in winter! A nice thick warm sleeping bag is the stuff of dreams during a winter camping trip. Adding insulation to lock heat in and provide comfort, the best type capable of keeping you warm even in temperatures down to 0°F is the mummy sleeping bag. Exactly as it sounds, it keeps you cocooned in warmth with a sculptured drawstring hood that locks the heat in. Coleman has added extras like an insulated footbox and Thermolock tube which provides heat retention and warmth incorporated into the quilting construction so it’s soft, fluffy and like sleeping on a cloud no matter how cold it gets outside. The biggest trick to staying warm during a winter camping trip is dressing in layers. Thermal underwear is a huge part of that and probably the best investment you will ever make. They are cheap, snuggly, and come in all sizes and colors. If you would prefer something a little less clingy, then just order a set one size up. Here are some popular options for thermal underwear in mens and women's fit. Be sure to check the size chart. Thermal socks are also a terrific idea before hitting the trails. Always make sure to take a backup pair or two to keep your feet dry because cold wet feet is one of the biggest contributors to discomfort, getting sick and even frostbite. Arctic Extreme thermal socks are also wicking, drawing moisture away from your feet and keeping them as dry as possible. They are padded and have a fuzzy soft lining making them extra comfortable and warm. Once inside and all zipped up for the night, duct taping a thermal blanket across the top of your tent will reflect your own body heat back down to you helping to retain the heat you generate instead of it dissipating through the walls. It also has the added bonus of being used in case of emergency. Primacare foil thermal blankets are waterproof and perfect for keeping the heat in your tent before you get to the point of needing an emergency blanket. Just be sure to buy two, one for your tent and another for the first aid kit just in case. Because we lose most of our body heat through the top of our heads, a knit hat or balaclava will help you stay warm. Plus, it also keeps your ears warm which has been known to help you sleep even better. SelfPro unisex balaclava can be worn six ways, is wicking, highly breathable and lightweight making it perfect for winter camping. We hope these tips and tricks help you get out there, and that your next camping trip is the warmest yet!